Many folks who have spent time on the lower Deschutes River this summer have noticed something unusual. Smallmouth bass, typically quite rare in the lower Deschutes, are suddenly present in large numbers. What are they doing there? Where did they come from? How does their presence affect resident fish? Today, we attempt to answer some of these questions, in two parts. In the first part of today’s post, we give an overview of this summer’s bass invasion, and attempt to sort out why we’re suddenly seeing so many of this particular species. In the second part, Steve Pribyl, former Oregon Department of Fish and Wildlife Fisheries Biologist for the lower Deschutes River, provides a history of smallmouth bass in the lower river—a critically important perspective on what we’re seeing in the river this year. The weird things happening in the lower Deschutes River and its tributaries just never seem to end. 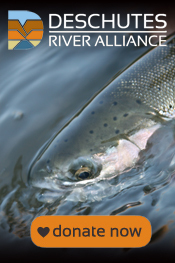 A year ago the big story in the lower river was the two fish die-offs in June and early July. First with sockeye near the mouth, then spring Chinook near the confluence with the Warm Springs River. This year, like in a science fiction movie, it’s the invasion of smallmouth bass. In a science fiction movie the bass would be from outer space, but in this case they are, in all likelihood, from the Columbia River. Almost as soon as anglers began fishing for steelhead this summer in the Deschutes River’s lower 40 miles, we started hearing reports of smallmouth bass being caught. There have always been stories and rumors of a bass being caught here or there, perhaps once or twice a season in the lower river. But the reports this summer were of six bass being caught at a time! Or a dozen or more in a single float trip. Far more bass were being caught than steelhead (no surprise given the weak steelhead run this year). By mid-August we had reports of smallmouth bass being caught as far upstream as Buckhollow Boat Ramp. The most successful lure or fly for catching smallmouth in the Deschutes this summer was the Blue Fox spinner. We also heard reports of smallmouth bass being taken on steelhead flies, with streamers seeming to be the most productive. It is worth noting that these are not the sorts of flies and lures one would use if purposefully fishing for bass! The problem with the bass invasion is that no one seems to know if these fish have moved in permanently, or are just visiting. We’ll not know until next year. But there is reason for alarm. If these fish do become residents in the lower Deschutes River, the redband trout population is at certain risk. Smallmouth bass and redband trout do not coexist well. Multiple examples abound of healthy rainbow trout populations being decimated after the introduction of bass into a trout fishery. Why are smallmouth bass moving into the lower river? The most likely answer anyone has proposed is that warm spring water temperatures in the lower Deschutes River lured bass up from the Columbia River. Bass come out of winter dormancy when water temperatures reach the mid- to upper fifties, or even sixty degrees. They then seek out warm water to increase spawning success. This year the lower Deschutes River reached those sorts of temperatures over a month before the Columbia River did, likely attracting bass at that time. (For a biological discussion of smallmouth bass and temperature influence on bass behavior, see http://www.dfo-mpo.gc.ca/Library/337846.pdf ). The following graph shows that the Columbia River in The Dalles pool reached 60 degrees F right around June 1. And this graph shows that the lower Deschutes River at Moody (just upstream from the confluence with the Columbia River) first reached 60 degrees F in mid-April. Another important question as we unravel this mystery is whether the lower Deschutes River at Moody is warmer now than it was prior to selective water withdrawal operations at the Pelton-Round Butte Complex. There are no data with which to make that determination, as there wasn’t a temperature gauge at Moody until July 2011. However, the following graph shows that temperatures immediately below Pelton-Round Butte are now much warmer in the spring than they were prior to the commencement of selective water withdrawal operations. Previous DRA research has illustrated that these higher discharge temperatures at Pelton-Round Butte impact river temperatures all the way to the confluence with the Columbia River. So it’s quite likely that spring temperatures at Moody are now significantly higher than before SWW operations began. Unfortunately, these higher spring temperatures resulting from SWW operations may very well be responsible for this year’s smallmouth bass invasion. It has been suggested that bass in the lower Deschutes River might be of little consequence as bass and other species seem to be coexisting in the John Day River. But this is not an analogous situation. There isn’t a redband trout fishery in the John Day River that would be threatened by smallmouth bass. Juvenile anadromous fish are said to migrate down the John Day River somewhat earlier in the year than Deschutes River steelhead and Chinook juveniles. This means that in the John Day River the juveniles are migrating in colder water temperatures, when smallmouth bass are still dormant. We won’t know the longer-term consequence of this year’s bass invasion until next year. If juvenile bass are present in the lower Deschutes River, it will be safe to assume that they have colonized the lower river. I worked for the Oregon Department of Fish and Wildlife as a fish biologist on the lower 100 miles of the Deschutes River from 1977 to 1980, and again from 1985 to 2004. In addition to this work experience, I fished the river extensively during those years and have been able to spend even more time fishing since my retirement. I am very familiar with the history of smallmouth bass in the lower Deschutes River. With the exception of drastically increased smallmouth bass abundance in 1996, which I will discuss below, there has always been a very, very small background number of smallmouth bass in the Deschutes River downstream from Macks Canyon (river mile 25). Before this year, the furthest upstream that I had personally observed a smallmouth bass was at Bull Run (river mile 18), with other very occasional observations downstream from there. I fished the river downstream from Macks Canyon extensively for both trout and summer steelhead for almost 40 years before catching my first smallmouth bass this summer. Similarly, friends of mine that have guided professionally for steelhead on the river, several for more than 30 years, have caught very few smallmouth bass. Prior to this summer, these friends relate to me that in their entire careers on the Deschutes (with the exception of 1996, as discussed below), they probably caught less than 10 smallmouth bass total in literally thousands of days on the river. Steve Pribyl with a recent catch. 1996 was an unusual year in the lower Deschutes River. That year, smallmouth bass were very abundant downstream from approximately Harris Canyon (river mile 12). In August 1996, guides reported catching up to 8 or 10 smallmouth each day while fishing for summer steelhead. I recall rowing an enforcement trip with members of the Oregon State Police, Fish and Wildlife Division, that summer where we contacted two anglers at Sharp’s Bar (river mile 5.5) that were actually targeting smallmouth bass and having considerable success. I specifically remember this event because while we were observing these subjects at a distance through binoculars, it appeared they were catching and keeping trout in excess of the legal size and catch limits. I recall the disappointment of the Oregon State Police troopers when further investigation revealed the fish to be smallmouth and no citations were going to be issued! Smallmouth bass continued to be caught regularly and in impressive numbers throughout August and into early September of that year, but disappeared from the catch by mid to late September. The sudden abundance of smallmouth in the lower Deschutes River in 1996 was both troubling and curious to me at the time. Large numbers of smallmouth had been present in the Columbia for many, many years, and the fish were present in Lake Billy Chinook, the reservoir formed by Round Butte Dam at about river mile 110. Yet they were rarely seen in the Deschutes River. I theorized at the time that either water temperatures in the Deschutes were colder than smallmouth bass really preferred, or the gradient of the Deschutes was higher then they could cope with very effectively. Either or both of these factors kept smallmouth bass from colonizing the river from upstream or downstream. Yet suddenly, in the summer of 1996, large numbers of smallmouth bass were present in the lower 12 miles. The temperature regime in the Deschutes had not changed that year, and obviously the gradient had not changed to allow smallmouth to live more effectively there. With the information at hand, we formed a theory about the sudden increase in smallmouth bass that year. The passage of time, while not proving the theory correct, certainly has not disproved it either. There was a very large rain on snow flood event in early February, 1996. Without researching flows in the Deschutes basin, I do recall that flows at the Moody gage were in excess of 70,000 cfs and that Warm Springs River at its mouth flowed in excess of 30,000 cfs. Large volumes of flood water coming into Lake Billy Chinook necessitated a period of spill from the reservoir. Again, without researching it, I don’t recall how much was spilled, or for how long, but it was substantial. We theorized that there were many smallmouth bass entrained in that flood spill and passed through both Lake Simtustus and the Reregulation Dam Reservoir into the flowing Deschutes. These smallmouth bass, finding the upper parts of the Deschutes colder than their preferred temperature, progressively moved downstream until they found the warmer water of late summer in the lower 12 miles more to their liking, where they then took up residence. When water temperatures cooled in mid- to late September below those that smallmouth prefer, the fish again started to move downstream, this time into the Columbia. After 1996, smallmouth were again only a very rare capture, and I largely quit worrying about the species invading the lower Deschutes. Smallmouth abundance in the lower 12 miles of the Deschutes has changed dramatically in 2016. In July, anglers started to catch five to ten per day while targeting steelhead, with steelhead gear in steelhead water. Several anglers in early August have actually targeted smallmouth and report catch rates of up to 10 smallmouth per hour, catch rates that would be considered good on the John Day River, a regionally famous smallmouth fishery. Smallmouth in excess of 16 inches in length have been reported from the Deschutes this summer. Even more unusual—and almost beyond belief—is the photo documentation of a largemouth bass caught in the Deschutes at river mile 12 in early August! This is the one and only documented largemouth sighting I am aware of in the Deschutes and I can’t even begin to wrap my head around what that means. The obvious questions are (1) where are these smallmouth bass coming from, and (2) what has changed to allow the species to flourish in the lower Deschutes? With regard to the first question, I believe these fish are traveling up the Deschutes from the Columbia River. The protocol at the Pelton-Round Butte fish passage facility is to not pass smallmouth captured at that facility downstream into the lower Deschutes, so it is unlikely the fish originated above the dams. So what is allowing smallmouth to flourish in the lower river this summer? While stream gradient in the lower Deschutes has obviously stayed constant, temperatures in the lower Deschutes have changed significantly. I believe PGE’s surface water withdrawal operations, designed to aid downstream juvenile passage at the Pelton-Round Butte Complex, have increased water temperatures in the lower river enough, and for a long enough period of time, that smallmouth bass are now able to invade the Deschutes from the Columbia River and find conditions that have apparently allowed them to flourish. It remains to be seen how long smallmouth will now continue to use the lower river, but with continued releases of warmer water into the Deschutes from the surface of Lake Billy Chinook the situation is not likely to change. This is certainly troublesome, given the obvious negative impacts to resident salmonids from smallmouth predation.